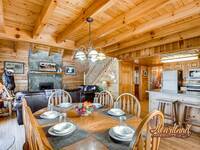 This amazing 4 bedroom, 3 bath Cabin with WiFi accommodates up to 8 people in total comfort! 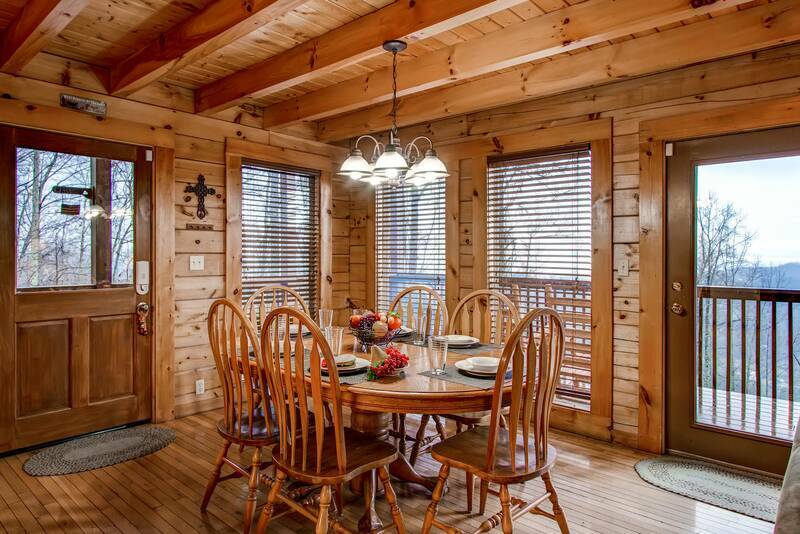 This Cabin is between Pigeon Forge and Wears Valley. 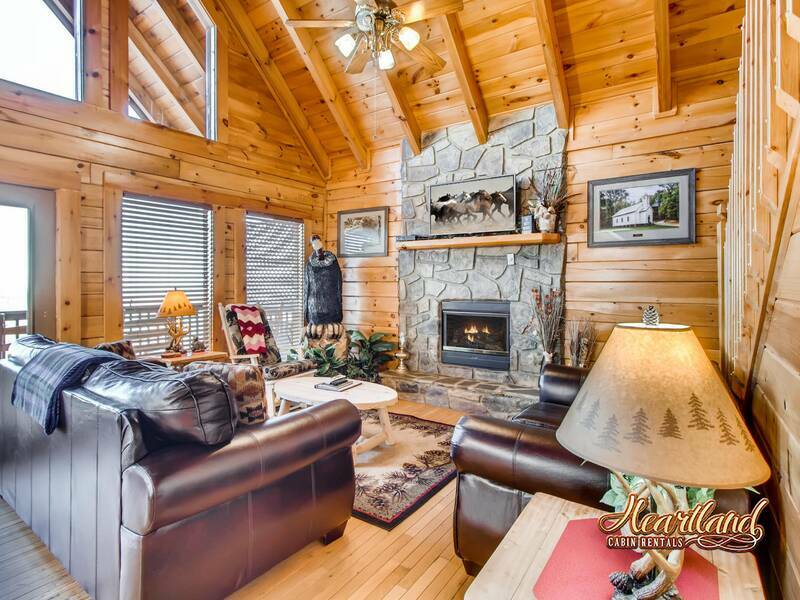 Upon entry at this beautiful cabin, you are greeted by the stunning natural wood interior and numerous windows that frame the breathtaking Smoky Mountain view outside. 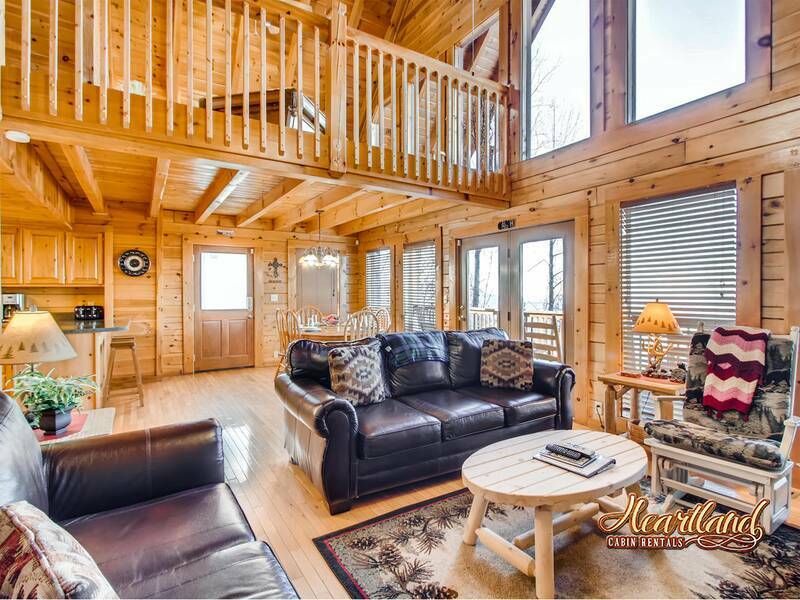 In the living room, you’ll enjoy the wonderful mountain themed decor, stone accented fireplace and access onto the main level deck. 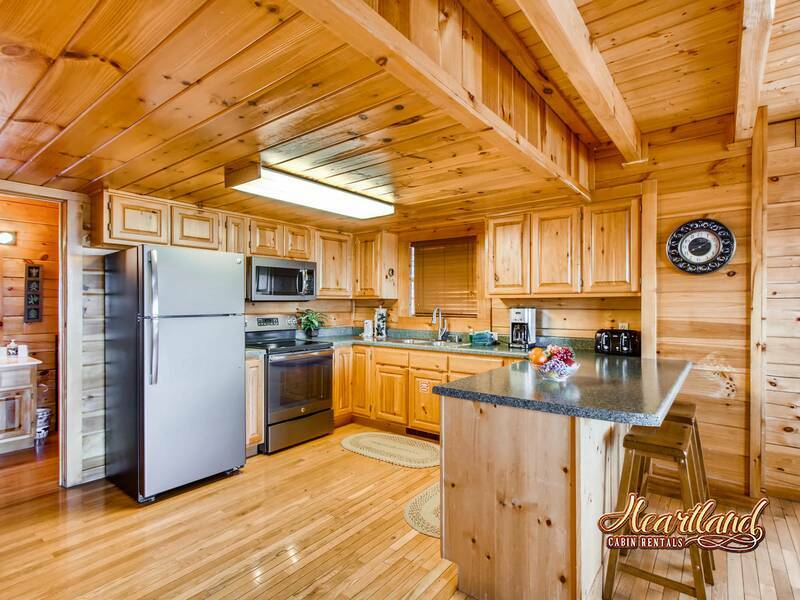 Located off of the living area is the fully equipped kitchen, perfect for preparing and cooking a delicious in cabin meal for all of your friends and family to enjoy. 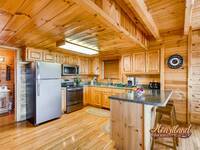 Next to the kitchen is the dining area that looks out directly into the Smoky Mountains. 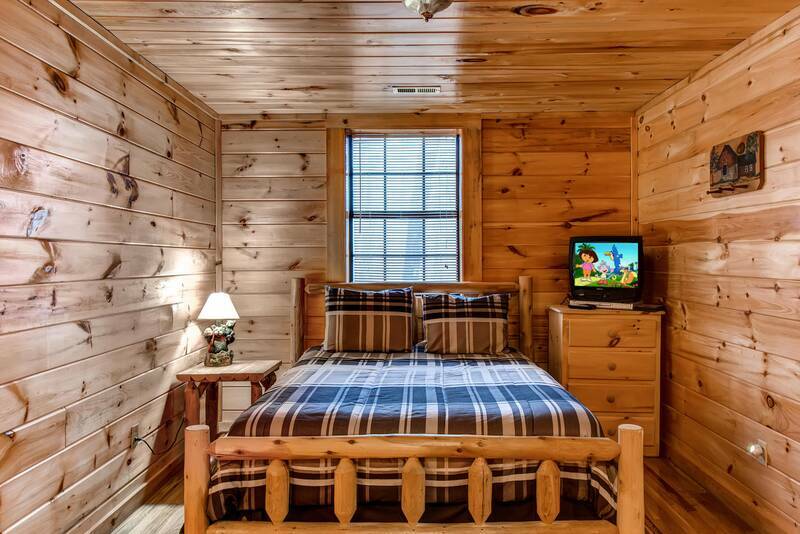 The main level also features a super comfy log queen bed and TV. If you’re in need of a little rest and relaxation while you’re on vacation, this is where you’ll want to be. Located on the second floor is the loft style game room. 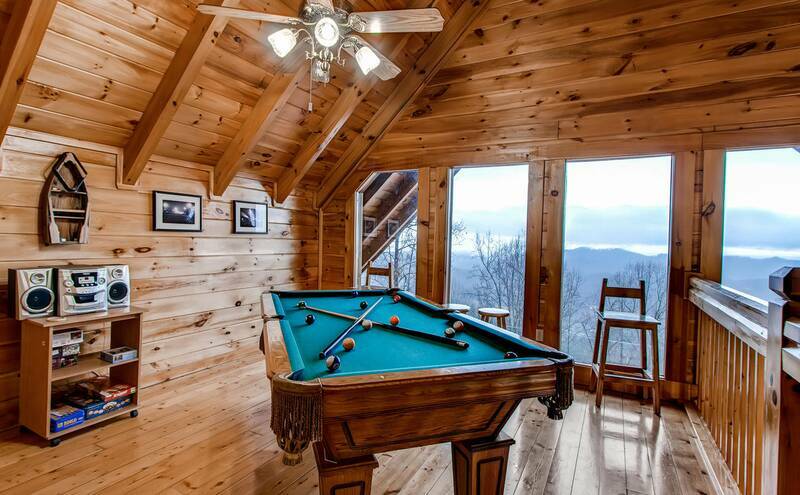 Challenge your friends and family to a game of pool or just kick back and stare at the amazing view of the Smoky Mountains. 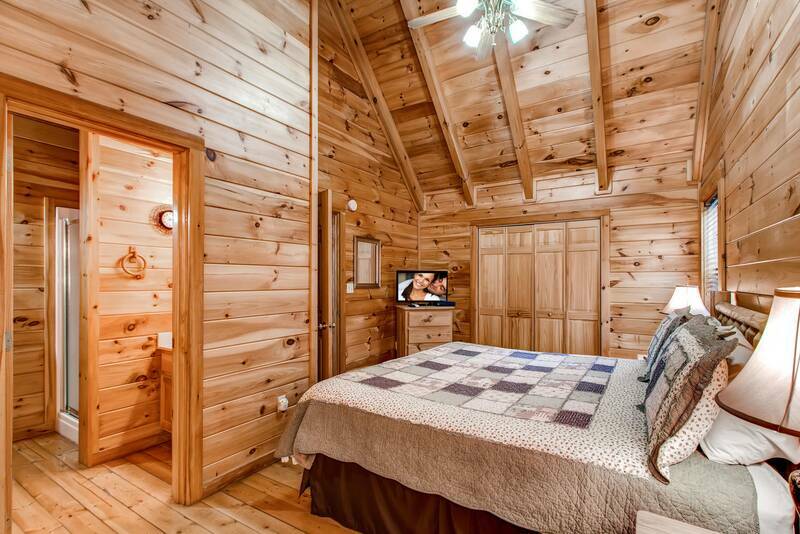 Upstairs you’ll also find a spacious Master King bedroom with cathedral ceiling and a full bath. 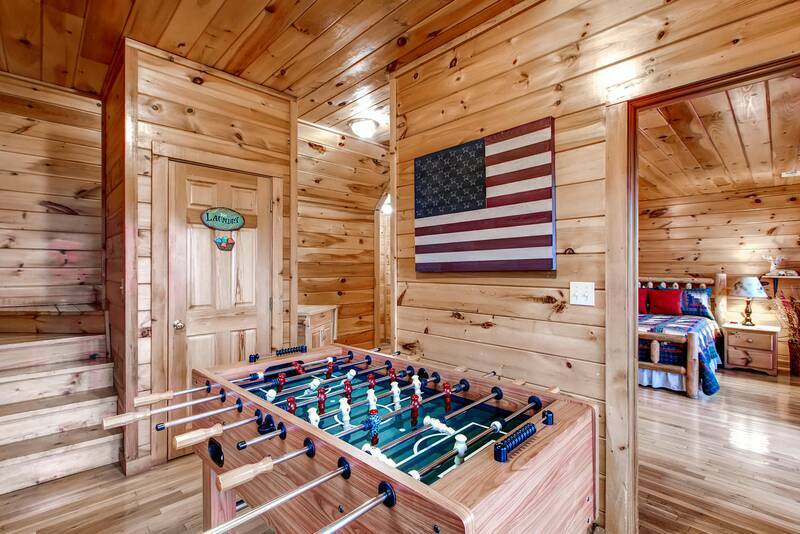 Take a walk to the lower level and you’ll enter the Foosball table gaming area. On this level are two additional bedrooms. 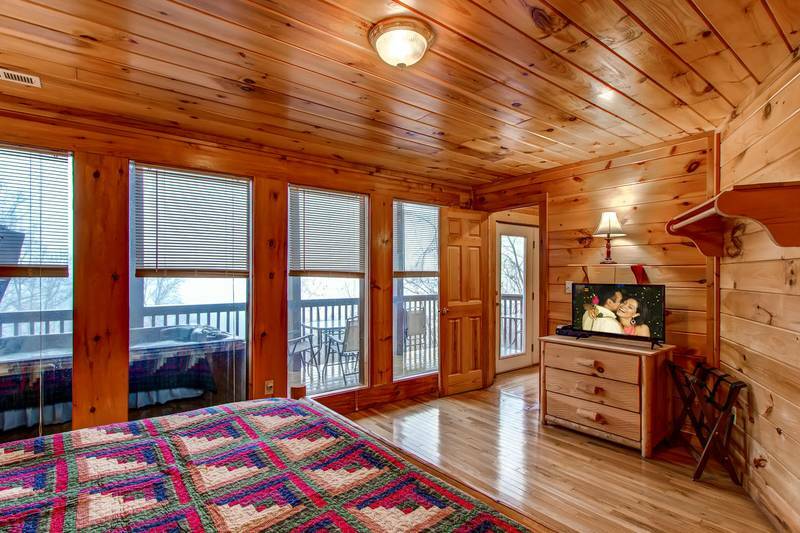 One is beautiful king bedroom with enormous windows that look out into the mountains and the other is two queen beds with natural wood accents all around. 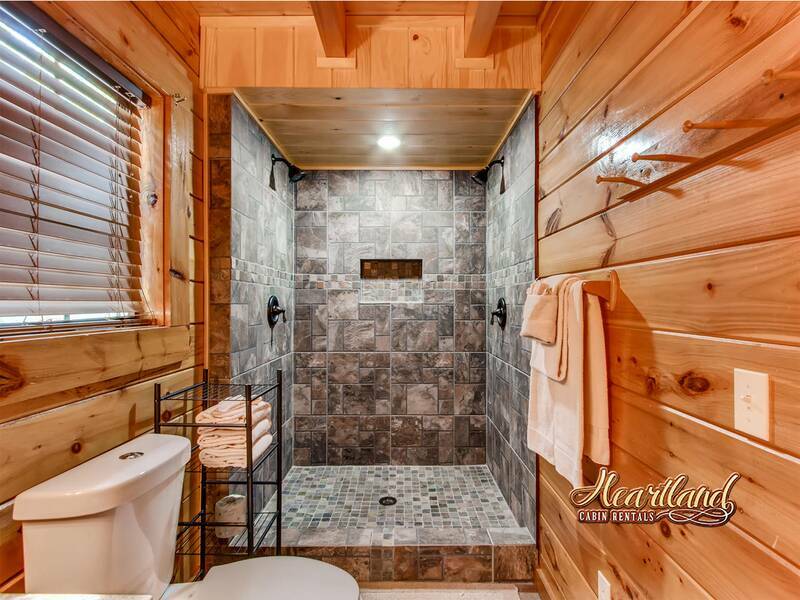 There’s an additional full bath located on the lower level for added convenience. 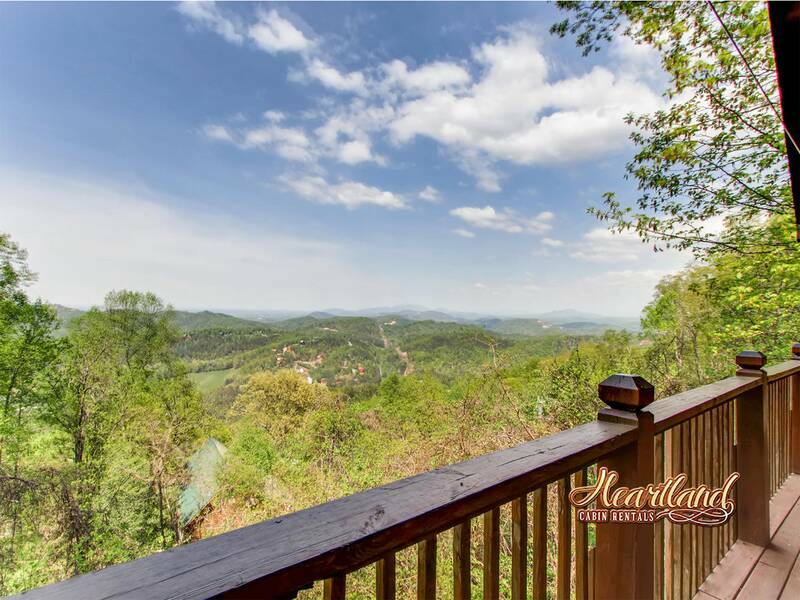 If you're coming to Gatlinburg to enjoy the breathtaking views, then you’ll love being at Buzzard’s Roost. With a complete 180 degree view of the mountains and surrounding area, you’ll definitely fall in love with the beauty that surrounds you. 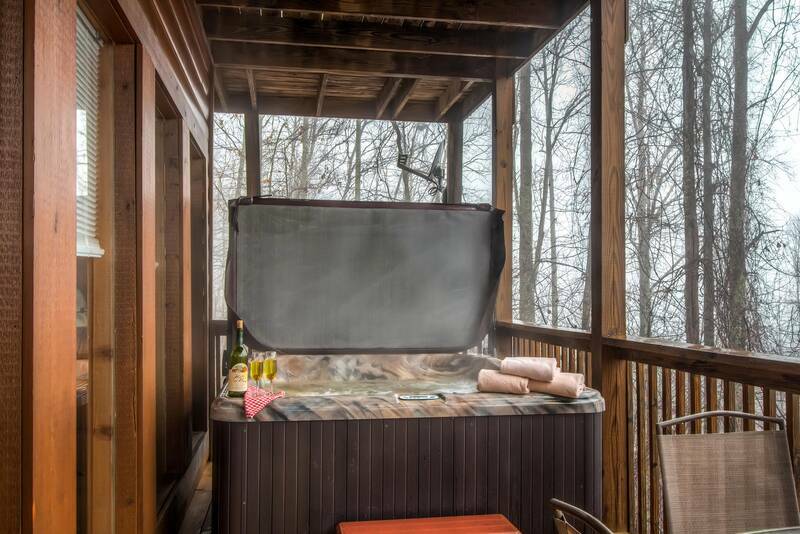 The main level covered deck features rocking chairs, a BBQ grill – on the bottom deck and a bubbling outdoor hot tub - either deck is exactly where you’ll want to be a on a cool Smoky Mountain night or just when you want to kick back and relax. 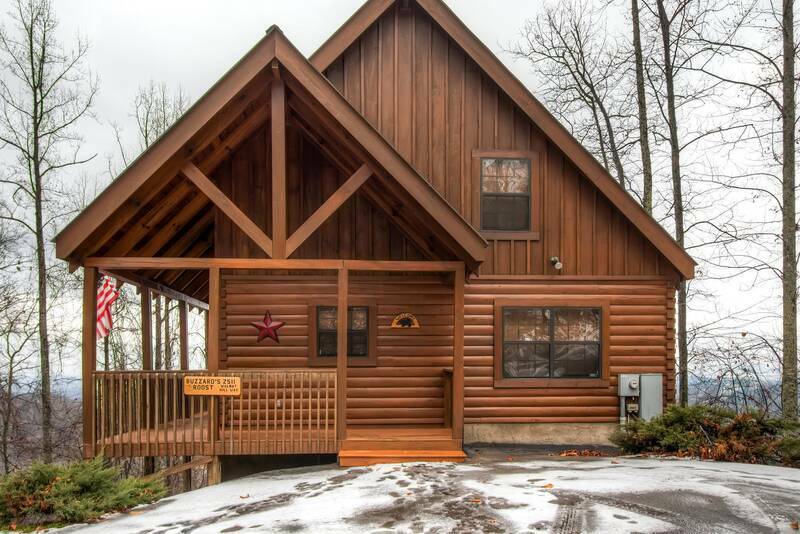 This spacious Smoky Mountain log cabin rental is the perfect place to enjoy all of the wonderful things to see and do while on vacation in Wears Valley or Pigeon Forge! 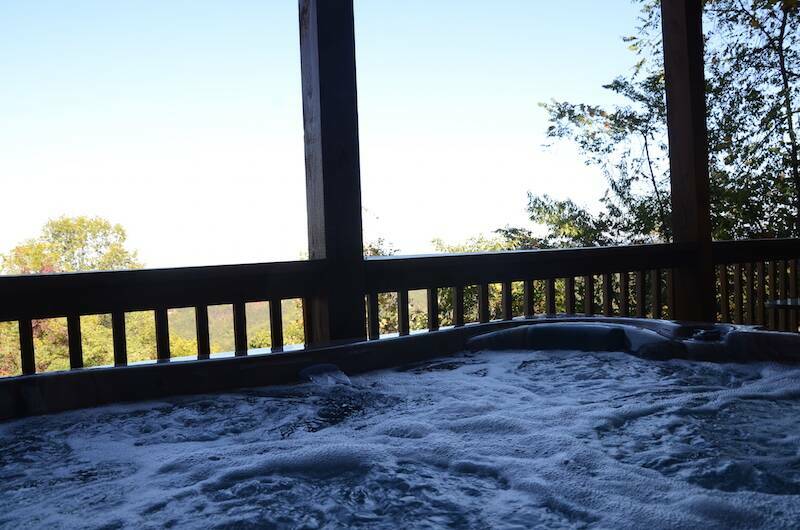 With stunning views, a relaxing atmosphere, and countless amenities, you and your guests will cherish every moment at Buzzard’s Roost. 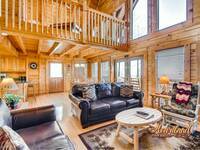 This is one of the best Wears Valley cabin rentals in the area! 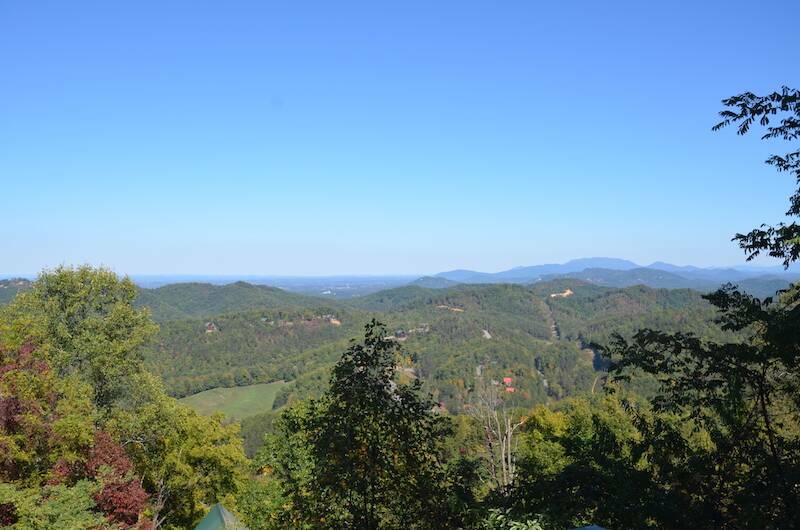 Come see why this area is known as the "Best Kept" secret of the Smoky Mountains. Guests of this cabin will have access to a large swimming pool, kiddie pool, picnic tables, lounge chairs, a full-service deli and grill and the catch and release fishing pond. Don't forget to bring your swim wear and pool towels to take a dip in the swimming pool or just relax in the sun. 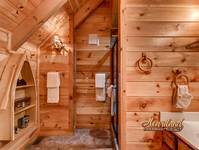 Nice cabin - Plenty of Ammenities - Great Staff @ Heartland! First off....KUDOS to the staff at Heartland. From start to finish, Heartland staff was on top of things! Thanks to the great customer service. Now to Buzzards Roost. Cabin was beautiful and exceptionally clean! The view was spectacular! Stocked with plenty of towels and kitchen gadgets and cookware. A couple of things I would suggest is that the weather stripping around the bottom floor french doors needs to be repaired. It was extremely cold on the bottom floor. If you cranked up the heat, the upstairs roasted (which is normal). We did purchase a small space heater to heat the bottom bedroom which was not a big issue. That's not gonna keep me from giving this cabin 5 stars. That would not have been an issue if it wasn't January. The only other minor issue is the smell of the hot water. Apparently there is sulfur in the water in that area. I might suggest to the home owners to install some type of filtration system to help with that. Smell is pretty strong in the showers. Again...that is only minor. 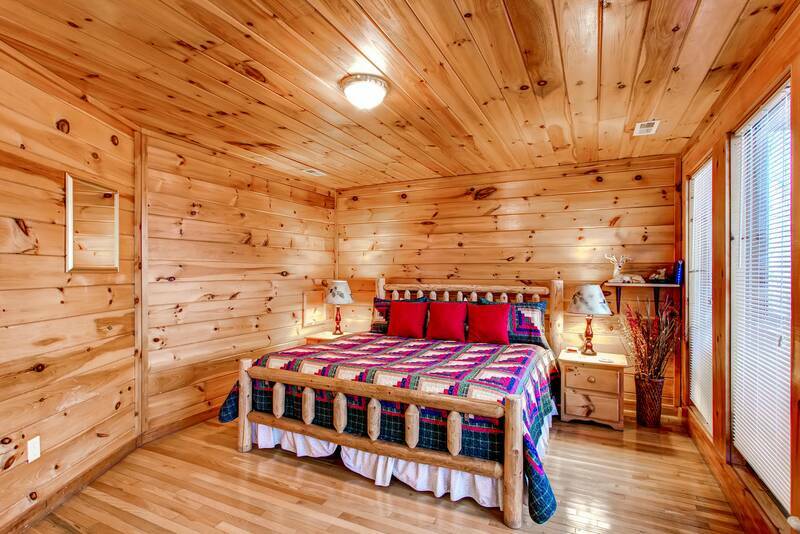 We would definitely stay here again or try out another location from Heartland. Clean Cabin with a Beautiful View! My family and friends have stayed at Buzzards Roost for 3 years in a row. 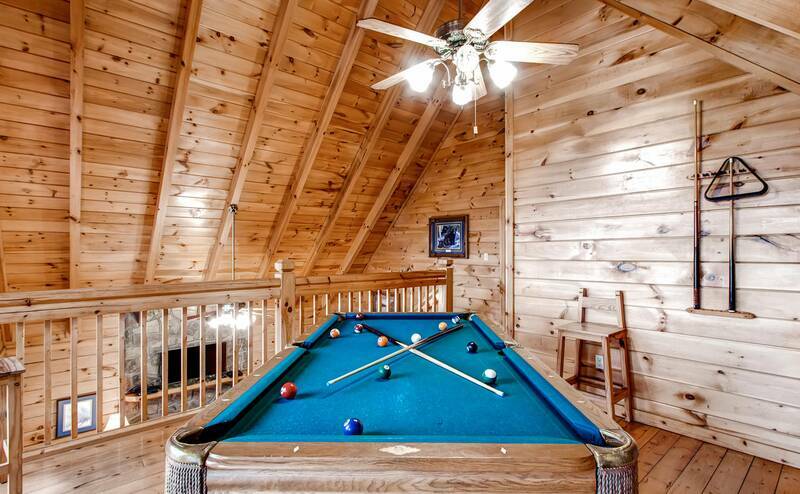 This is a beautiful 3-story cabin with a hot tub and pool table. The kitchen is well-stocked and the bathrooms are newly remodeled. The views are just gorgeous. This cabin is high up a private drive near the top of a mountain, so you feel much more isolated compared to cabin communities. 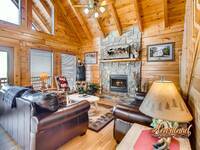 We love Buzzards Roost and can't wait to stay here again! We loved this cabin. My family just spent 3 nights and would have loved to stayed longer. The cabin was clean. It had a great view. We actually took pics of the sign and with the wood buzzard carving in hopes to return again. Great time with great friends with fabulous views. Staff were all helpful and pleasant. We did have to call maintenance regarding the gas logs. The cabin was clean and very comfortable. The kitchen needs some additional serving pieces such as a serving platter and some bowls suitable for side dishes. Awesome place to stay! Great location, plenty of room and very clean! Loved the views at this home! Woke up early to witness the sounds and sights of nature rising from its rest, and also to see the gorgeous sunrise. Enjoyed pool and foosball games as well as grilling dinner at night. 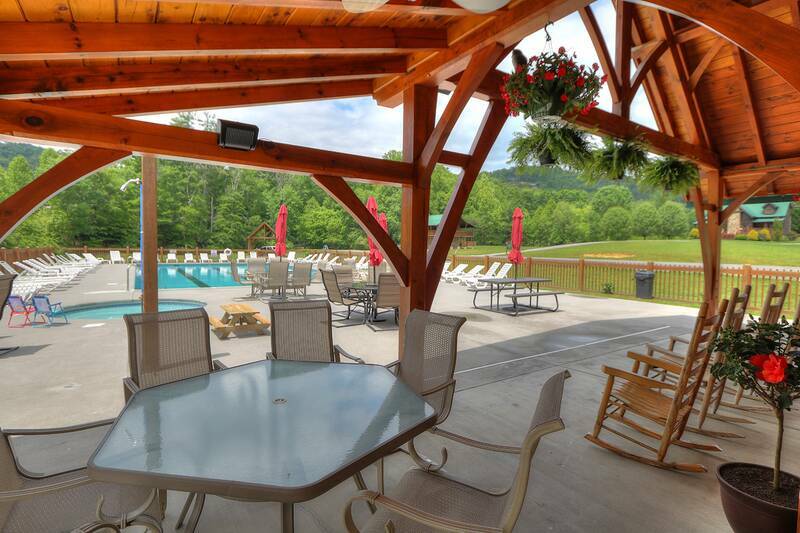 We loved the Wears Valley area and would definitely choose to stay here again! We really enjoyed our vacation! The staff was so friendly & didn’t seem to mind the phone calls or questions. Thank you for the great hospitality! 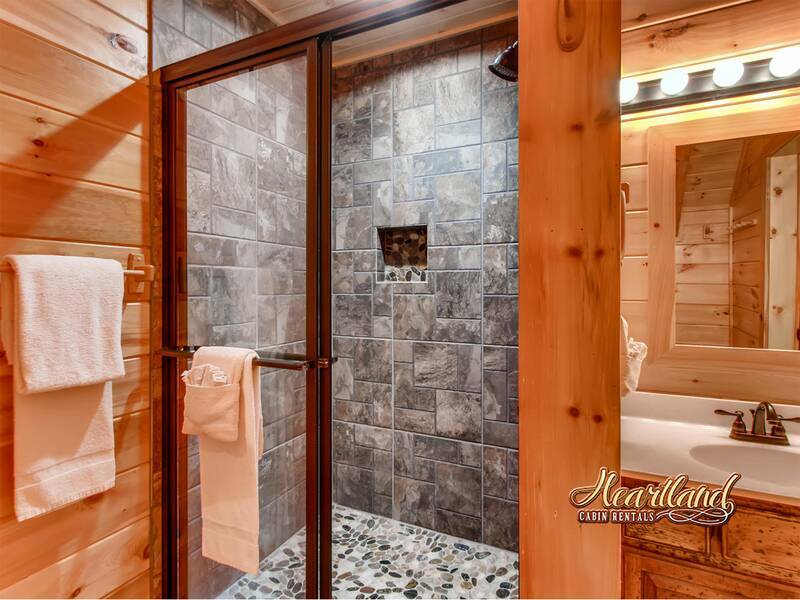 We come to the pigeon forge /gatlinburg area several times a year, and always use Heartland Cabin Rentals, this cabin was by far our favorite so far. It was a bit of a drive, but the view from the cabin makes the drive worth it. We had no problems while there, it was beautifully decorated, and reading about the cabin before coming and knowing the background made it more worth it!!! 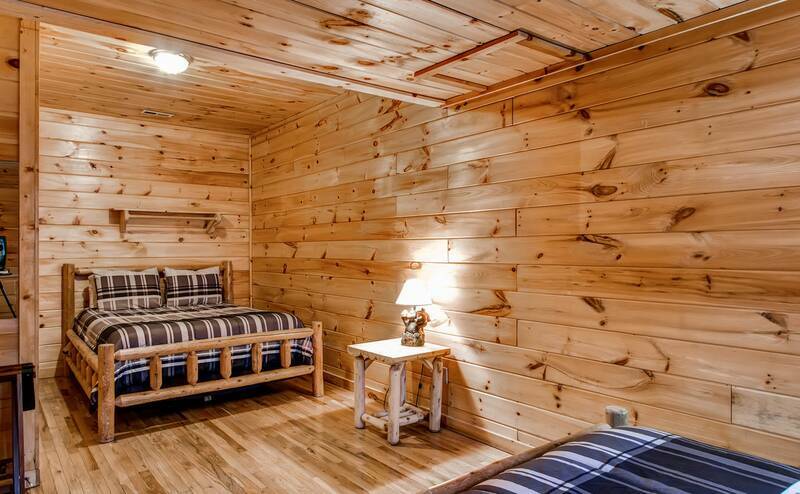 I would more than recommend this cabin to anyone!! Had a great stay. Everything was so cozy and convenient! Breathtaking views! Wonderfully equipped and clean home! The home was beautifully and comfortably decorated. 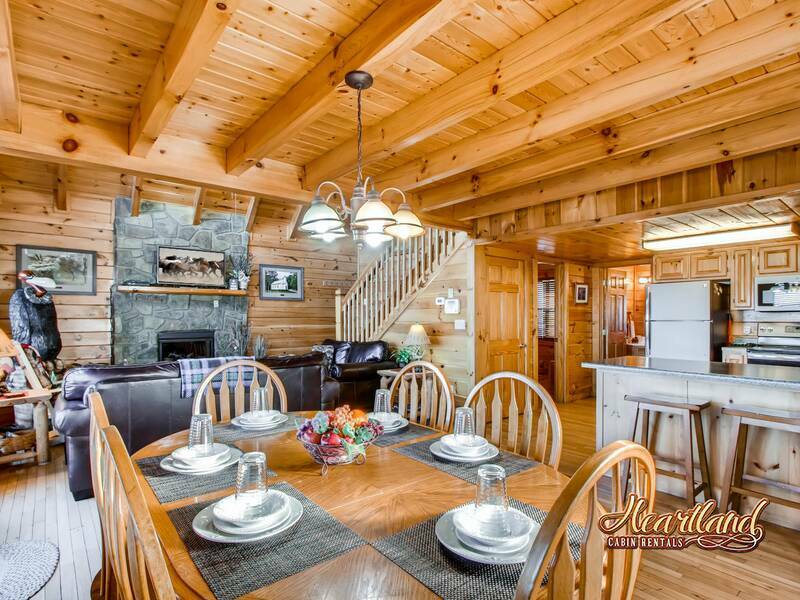 Spacious common areas and well stocked kitchens. Wonderful cabin with lots of room & breathtaking views! Heartland Rentals was prompt to assist us with any of our needs. We wish we lived closer so we could visit again & again! We had a great time on our trip. 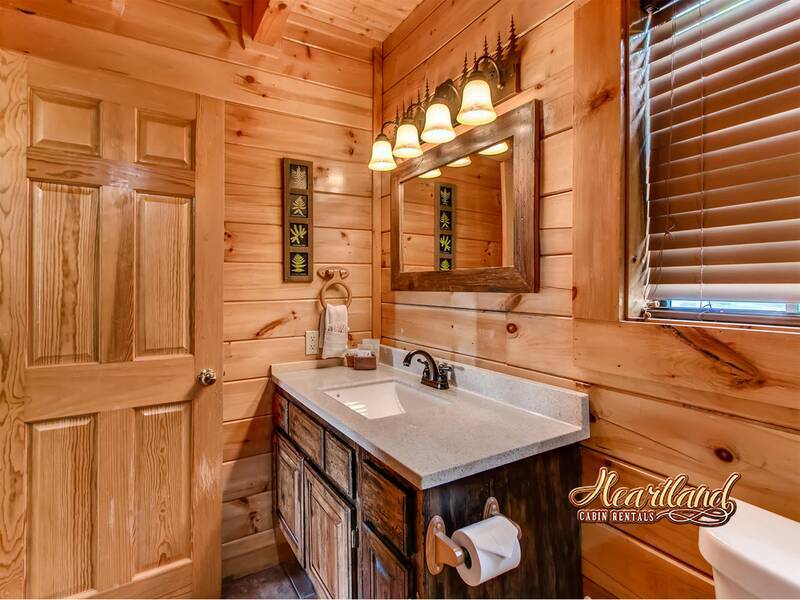 The cabin was nice and clean and the people we dealt with from Heartland were a pleasure. The cabin was everything we expected it to be plus some. The full kitchen is a big asset when you have a family and can save some costs for all meals. Cabin was clean and very nice inside. 4 bedrooms slept 8 comfortably. Only about 10-15min from Parkway. Only thing missing was a nice propane grill which would have made everything perfect, this cabin has a charcoal grill. Still a great location and would recommend staying there again. Couldn't ask for more great place and a great story behind the place. Was looking last minute for a place for my whole family and this was opened named after a Marine and I had just got out of the Marines. It was meant to be awesome views will definitely stay there again. Our overall stay was great, plenty of room for us all and the description of the cabin was dead on. Cabin was very nice, good decks with view and very quiet. Beds were comfortable, couches good and hot tub was nice bonus. Place does need some minor repairs. Kitchen faucet is hard to move between sinks. Bathroom faucets hot/cold buttons pop off when you turn water on. Kitchen needs a few more small sauce pans and skillets. I would definitely consider returning and recommending it as a great place to stay in the area. The cabin was amazing!! The view was so beautiful!! 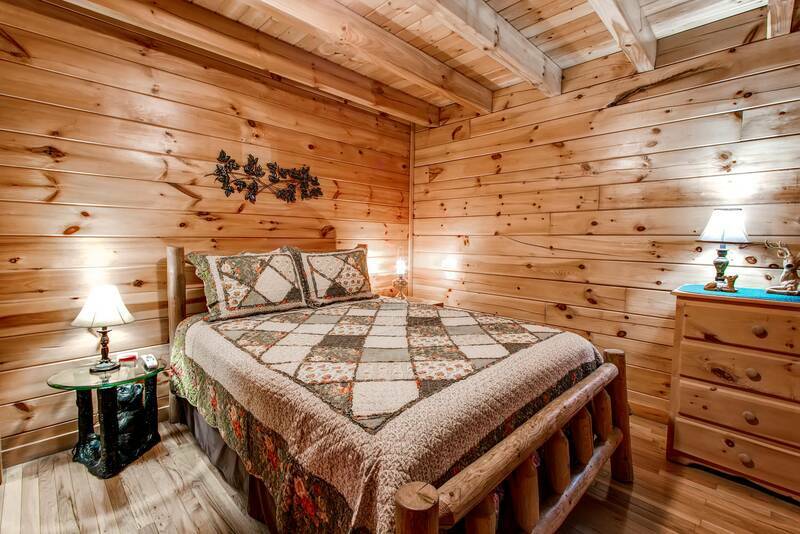 Everything in the cabin was great and we will come back to this cabin again!! We have enjoyed the cabin a lot with our family. The cabin is AWESOME!